Most people feel like they could do almost anything if they just knew what to do and how to do it? Is there a proven system of success that almost anyone could easily follow? Success is being effective in manifesting desired results with ease and elegance. No unintended side effects! It is the ability to accomplish your intentions and making space to enjoy the fruits of your efforts rather than living in stress. Success is mastery in action. To achieve what you want in this way is to know what it is, and to have a clear direction and system for getting to your destination. It starts with having a vision and sustaining the excitement by keeping an eye on the big picture and handling the details with the greatest amount of certainty, simplicity and grace. Stress, says James Earl, can result when the mind is overloaded with details. The problem? Detail is so much a part of our business and personal life that it won’t go away. Therefore it must be organized, stored and retrieved with ease and quickly…. 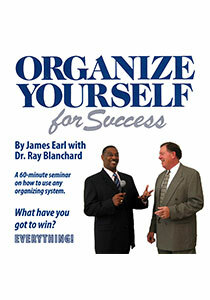 That’s why James Earl, with Dr. Ray Blanchard, has developed a remarkably simple method for your handling of details. The intention is to free up your energy, approach your work more creatively and enjoy achieving your dreams, whether they are business and personal ones. Accomplishment is the key, not merely activity and busyness. In this audio, an exciting 60-minute seminar is provided on how to use any personal organizing system most effectively, while following a proven 8-step formula for consistently hitting your goals. Some highlights are “clearing the mind”, “envisioning results”, “effective planning”, “sequencing”, “integrity”, “discipline”, and “states of mind for maximum performance”. Copyright 2019 by One And All.